You could save thousands on your FHA mortgage by refinancing to take advantage of FHA’s lower mortgage insurance premiums. In January of this year, FHA (Federal Housing Administration) announced an immediate reduction in mortgage insurance premiums (MIP). Lower FHA mortgage insurance premiums have made buying a home more affordable, while also making it profitable for many homeowners to refinance. With lower mortgage insurance premiums, the effective mortgage rate of an FHA loan is lower, putting thousands of existing FHA-backed homeowners “in the money” to refinance their existing FHA mortgage with an FHA Streamline Refinance. Many homeowners with an FHA mortgage, therefore, are saving thousands of dollars by refinancing to take advantage of lower MIP rates. Previously, FHA loans with a loan-to-value ratio greater than 95% require that the borrower pay monthly mortgage insurance based on an annual rate of 1.35%. 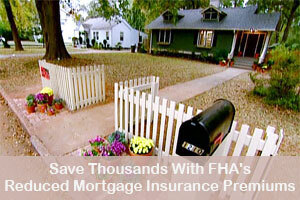 Now with lower mortgage insurance premiums, the rate is reduced to .85%. For example, an FHA loan of $150,000 had a monthly mortgage insurance premium of $168.75 in 2014. But now, with the reduction of MIP to .85%, the monthly payment is reduced to $106.25 for a savings of $62.50 monthly. Over 10 years, the savings on a $150,000 mortgage would be $7,500. And over 30 years, the savings would be $22,500. And if you were to have a higher mortgage, the saving increase. For more details about the new annual MIP rates amortization term, loan amount, and loan-to-value ratio, see FHA’s Reduction of Mortgage Insurance Premiums Lowers Mortgage Payments, and Could Boost Home Sales. An additional benefit of lower mortgage insurance premiums, resulting in a lower effective mortgage rate of an FHA loan, is that more borrowers can qualify to purchase or refinance a home with FHA. Borrowers who did not qualify for an FHA mortgage, or qualify to refinance with FHA, before the MIP was lowered in January of this year, could possibly qualify now. To see if you could save by refinancing your existing mortgage, simply speak with a mortgage loan originator. You will be asked a few questions about your existing mortgage, and the mortgage originator can explain your refinance options based on the information given. If you are located in Florida, Virginia or Pennsylvania, we would appreciate the opportunity to help you with your mortgage needs. Please contact us direct via email or telephone, and one of our mortgage loan originators will be happy to assist you.